The project was commissioned by Scottish Power and involved extensive sea wall repairs and revetment works on the site of the former power station at Methil, Fife. Fairhurst were originally commissioned to undertake the engineering design of the concrete facing and various repair works only. However, during the works it became evident that areas of the existing structure were in a significantly poorer condition than originally advised. As a result of this, Fairhurst provided the additional assistance that was required. The works measured 630m in length and were split into 7 areas. Included in the works was the construction of a 2.5m high by 1m wide concrete toe wall along the base of the sea wall, which was subject to scouring. 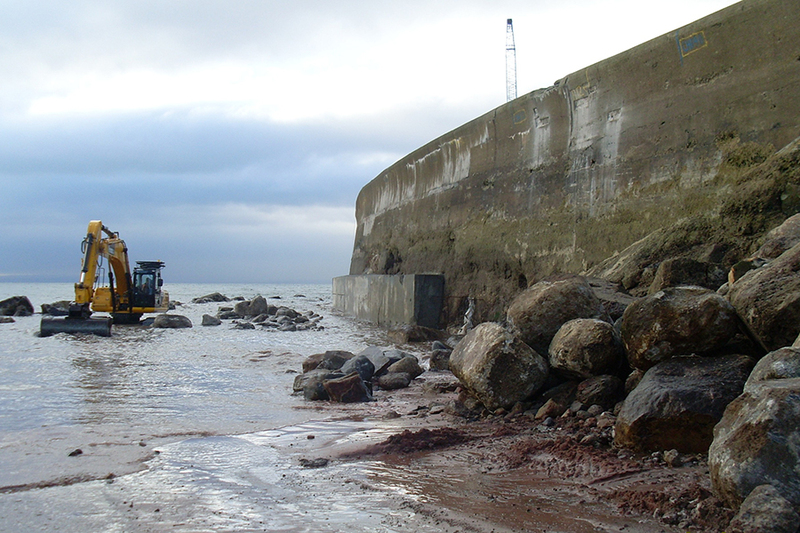 The works also involved the removal and disposal of blocks up to 7T from the beach/wave platform in front of the wall, in order to reduce the risk of damage under wave action. Repairs were undertaken to the wave trap spillway at the north end of the sea wall, which had been undermined by the collapse of the adjacent revetment. This section of revetment was fully rebuilt utilising existing materials on-site. Repairs were also applied to the extensive masonry revetments and included the filling of holes with concrete. Additionally, repairs were made to the masonry and concrete aprons using proprietary repair compounds and concrete where suitable.